A surrealistic tale of an émigré from Czechoslovakia in the 70s. Adapt! is a new play written and directed by Blanka Zizka, cofounder of the Wilma Theater and is having its premiere there this month. Half autobiography and surrealistic dream, the play dramatizes Zizka’s own experience as an émigré who left her Czechoslovakia in the late 70s, when it was still a repressive Soviet satellite state. 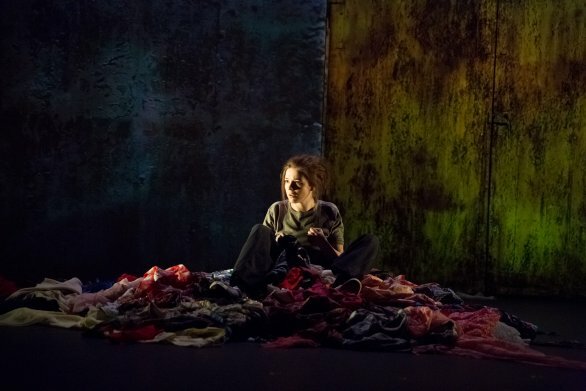 In the play Lenka is a young Czech woman who flees her country, is in limbo in a German refugee camp, before eventually making her way to New York and freedom. Before she gets there, Lenka (Aneta Kernova) is in limbo in a netherworld just outside a barbed wire stone wall that spans the Wilma stage. As she tries to get her bearings, she is subjected to ominous warning by the specter of an Old Woman in a stone chariot. Lenka is starving for food and desperately wanders in a hostile terrain. Suddenly a showgirl (Campbell Meaghan O’Hare) in a tight red dress appears and seems to be making garments rain down by vocalizing powerful orgasms into her microphone. Then a group of Soviet bureaucrats, in pig masks, roll onstage in leather chairs to interrogate Lenka about copy of Jimi Hendrix’s Electric Ladyland album and her relationship about her folksinger-activist boyfriend Marek (Jered McLenigan). Reality is equally as absurd as the surrealistic narrative. Lenka wonders if she is in her own dream. The Old Woman asks Lenka “Who are you?” and warns her that she will not find out by fleeing to New York. Flash forward to Lenka 35 trapped in a Manhattan apartment, in the bathroom hiding in the tub to get away from a dysfunctional relationship with a self absorbed writer Pavel. When he leaves and she puts on her robe and is suddenly visited by her younger self who asked her how she settled for such a suffocating existence. The younger Lenka turns up to confront her older self and they dance around, before younger Lenka rejects this characterization of her future self. Meanwhile there are flashbacks of her parents receiving the news that Lenka has left the country and what they will suffer because of Lenka’s defection. Lenka imagines lashing out at them for not being joining the cause for freedom fight. But ultimately Lenka must reconcile her own consuming guilt, particularly being separated from her younger sister Hana. Some wonderful performances starting with Aneza Papadopoulou ‘s earthy and ethereal Old Woman, ranting or chanting about the destruction of the trees or ‘returning to the cosmic egg’ and ultimately a snarky diva summoning the furies to spirit her away. Aneta Kernova gives a subtle, measured performance as Lenka, most affecting in the more meditative scenes. Krista Apple’ is hypnotic as Lenka 35, her physicality speaking volumes, in her volcanic scene with Steven Rishard who plays the babbling self-absorbed writer Pavel. Jered McLenigan is haunting as Marek, the Czech folksinger singing Karel Kryl’s protest songs. And Keith J. Conallen and Sarah Gliko play Lenka’s parents in a beautifully written flashback in which Zizka’s condenses everyone’s perspective and emotional torture. Other scenes strike as too sketchy and some freighted with heavy-handed symbolism. Those pig faced bureaucrats romping around to Madonna’s entire ‘Material Girl’ track begs for a quick fadeout. But Zizka’s blunt theatrical agitprop is certainly relevant given the current resurgence of Soviet draconian methods in Russia under Putin. Excellent production designs starting with Matt Saunder’s stark barbed wire wall with those Dante-esque doors that open and close magically. The wall also becomes the canvas for Christopher Ash’s transporting video atmospherics from the grey environs of the old world to the greenest promise of New York and artistic freedom. Zizka’s story has particular relevance now, as millions of refugees are forced to flee oppressive regimes and are likely to face an indifferent world and hostility abroad.